Time Warner Inc. (NYSE: TWX) stock is down more than 12% in morning trading today following last night's news that Rupert Murdoch's Twenty-First Century Fox Inc. (Nasdaq: FOXA) has removed its $80 billion offer to purchase the company. TWX stock opened at $74.90 after closing yesterday at $85.19. The statement came as a surprise to TWX investors who had pushed TWX stock to a 52-week high of $88.13 in mid-July shortly after the offer was announced. According to Murdoch, the fact that Time Warner's board refused to discuss the deal was one of the major reasons why his offer was retracted. "Our proposal had significant strategic merit and compelling financial rationale and our approach had always been friendly. However, Time Warner management and its board refused to engage with us to explore an offer which was highly compelling," Murdoch said in a statement Tuesday night. Another reason Murdoch pulled the offer was the performance of his own FOXA stock, which had dipped 11% since he made the initial offer. Fox shareholders were worried that he would overpay for the media company, like he did with the $5 billion Dow Jones (The Wall Street Journal's publisher) in 2007. FOXA stock jumped 10% in after-hours trading following the statement. Time Warner said it remains dedicated to providing long-term value to its shareholders, and backed up its words – at least initially – today. The company reported Q2 earnings per share (EPS) of $0.98, which beat consensus estimates of $0.84. Revenue was up on the quarter to $6.8 billion from $6.6 billion last year, although analysts had been expecting $6.9 billion. "We look forward to continuing to deliver substantial and sustainable returns for all stockholders," Time Warner officials said in a statement. A deal between Time Warner and Fox would have created one of the world's largest media companies, with combined market cap of more than $145 billion. It would have created a massive movie and television studio by bringing together cable networks, pay-TV options (HBO), and massive sports offerings. Time Warner will now be under intense pressure from shareholders to prove that it can be more successful without Twenty-First Century Fox. While today's earnings report was a strong start, shareholders will need to continue seeing growth, or pressure for a deal may mount. Previously, Time Warner executives claimed that they would need an offer of at least $100 per share to begin negotiations, and Murdoch's $85 per share offer seriously underwhelmed them. That's why it's possible that yesterday's rejection could have been a negotiation tactic from Time Warner. There's also the history of Rupert Murdoch himself. 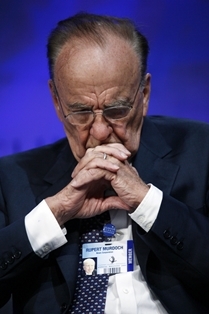 Murdoch's News Corp. (Nasdaq: NWSA) has made many large acquisitions throughout its history including Twentieth Century Fox, HarperCollins, and Fox Entertainment. In his 2007 purchase of Dow Jones, he reportedly paid a 67% premium for the publisher. Upping his $80 billion offer for Time Warner would not be unprecedented. The proposed deal also came at a time when several of the country's largest media distributors are attempting to complete huge mergers themselves. Comcast Corp. (Nasdaq: CMCSA) has been trying for months to acquire Time Warner Cable Inc. (NYSE: TWC), and AT&T Inc. (NYSE: T) has been working toward a deal with DirecTV (Nasdaq: DTV). These mergers between content distributors would give companies like Comcast and AT&T much greater negotiating power over content producers like Time Warner and Fox. A Time Warner/Fox merger would have created a large enough company to counterbalance that. "Too much thought went into Fox's bid to think that this is gone forever," BTIG Research's Rich Greenfield told The New York Times. "But now, for this to move forward, it's going to require Time Warner's interest." Share this story on Twitter @moneymorning and @KyleAndersonMM using #TimeWarner.